The philosophy we use in teaching this course is to start out with the basic funcamentals and progressivley add new concepts, both graphically and through code. As with all our examples they can be used royalty free in your compiled applications. Below are only a few of the many examples we have. 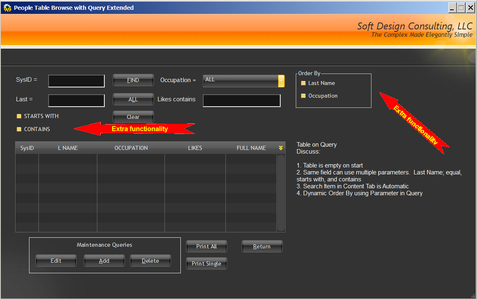 We start with the very simplest way to browse data and that is with a table control without any selection criteria. 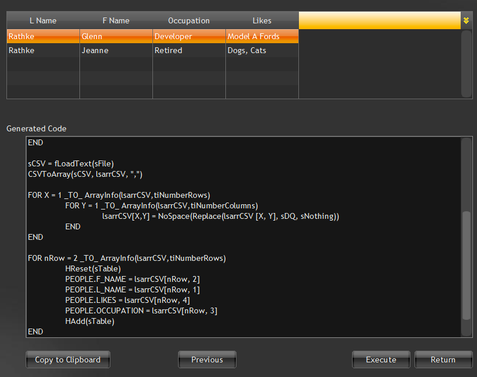 A few examples later we have you coding a Query by Example (QBE) to filter the data being returned. We cover concepts such as HFilter, Queries with parametrs, SQL statements, MSSQL stored procedures, etc..
Inbetween the two previous examples we have you create a simple maintenance form. 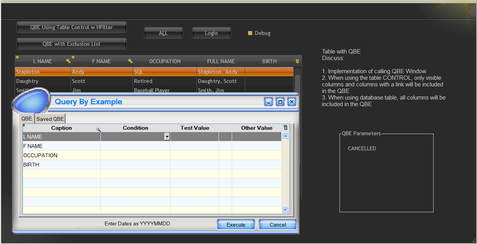 Later in the course we discuss using an included QBE example that you can use on any table browse to filter the records. Imagine not having to code the QBE every time, simply call it with one line of code. As with all our examples you can use them royalty free in your compiled applications. They give you a great starting point. We show you how to validate your data, showing which fields are required as well as making sure the required fields are filled in. 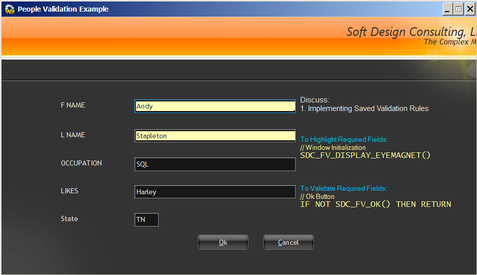 Up to this point, all data validation was done by writing code on each validate button. But this example only requires 2 lines of code. One for displaying the required fields shown in yellow and another to actually verify the data is filled in. 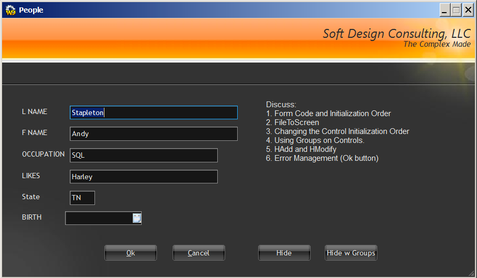 Imagine having different validation fields for different customers and not having to maintain separate applications. This example and the next is what we call our Dynamic Business Rules where you implement them and also create them. Along the way we will have discussed many topics which leads us to these more advanced examples. This example continues the discussion of Dynamic Business Rules where you select a table and field to create a business rule. Using this example in your applications is easy and straight forward. It creates WLanguage Code for you and stores it in a table for reuse on any maintenance form. This is a great example and makes for a great starting point for you to enhance it. Our training materials come with a 300+ page pdf manual and real world examples, of which a very few are shown above. Also included, is a 'How To' section with numerous examples to which we add on a regular basis. The included yearly subscription keeps your materials up to date, the first year is included at NC to you. New to our training matrials for WD version 18 we've added an example that illustrates many different facets of the W language, a generic CSV Import. As with all examples we build upon previous fundamentals which leads us from extremely simple concepts to more advanced while providing examples you can use in your copiled applications, all royalty free. 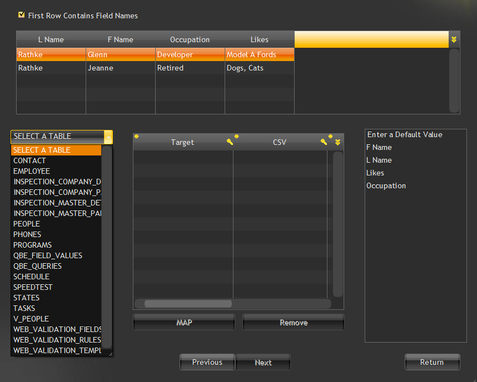 The next few graphics wil step through the proces of importing a CSV or XML file into you application. In this step you select the file type to import. 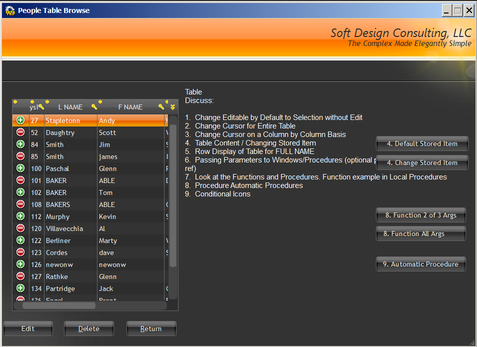 One selected and read, you can view the data and define whether or not the first row contains column headings. 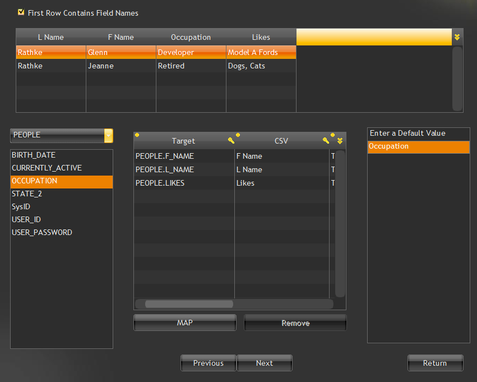 Next you map the fields from the CSV file to ANY table in your application. You can even specify a default value for the fields if you wish. 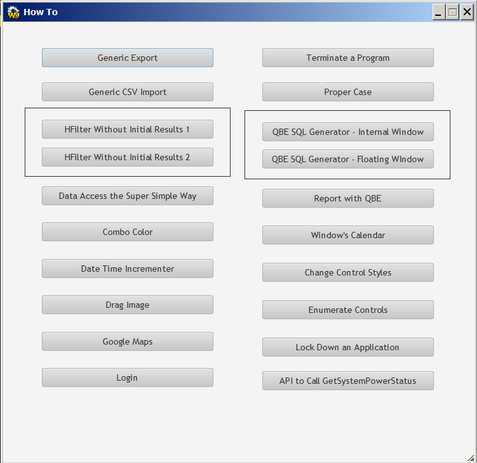 Once the mappings are completed as shown to the right, we move to the next graphic where the generaqted code is displayed. 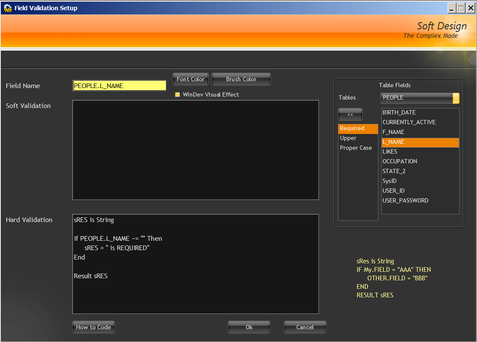 The entire process of importing a CSV file requires only a few clicks of the mosue for you or your end user. The great thing about this examaple is that ir produces WL code which you can change or run as is. It can even be saved to the database for reuse later, just as we do with our business rues. Whether it be a local class here in the St. Louis area, an onsite class at your location, the Self Training available here via the web, or our popular Streaming Video course all include the manual and examples. The core teaching of the material is based on WinDev (WD). 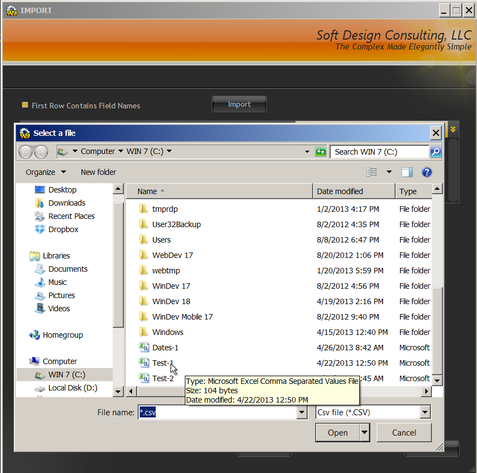 It started as the core of PCSoft's products and the other 2 products WebDev (WB), and WinDev Mobile (WM) with extensions be added for each of the other two products. The entire suite is often referred to as WX. We have additional examples avalable for WB and WM. They work nicely alongside the WD materials. Still not convinced, be sure to check out what others have said about our training on the Testimonials page.